When asked about overshooting on inflation, Bullard said: "I think we are going to end up overshooting on inflation. We have that as part of our forecast so we have for a while. That is what's going to happen…I don't have any problem with overshooting. You want to be as close as you can be to your inflation target, but it's a symmetric target. You can be above or below. There's no problem with that. So I think we are going to overshoot and hopefully they'll follow my policy choices and we won't overshoot very much, but I think we'll probably overshoot." He added: "I think the odds that we're going to fall behind the curve are moving up modestly here. I do think that labor markets are continuing to improve. We'll be at 4.5 percent unemployment by the end of the year." Bullard criticized the forecasts, also referred to as the dot plot, arguing that they contribute to uncertainty in financial markets: " I've started to wonder about the efficacy of the dot plot on the policy rate part because we're implicitly giving some kind of forward guidance through that dot plot and I'm wondering whether that's counterproductive at this point… I've thought myself about unilaterally pulling out." MICHAEL MCKEE: Welcome to all of our listeners and viewers on Bloomberg Radio, Bloomberg Television, and bloomberg.com around the world. We are speaking with James Bullard. He is the president of the St. Louis Fed, considered a centrist on the Fed and somebody who follows the macroeconomic developments very closely. A lot going on in the markets these days as investors try to re-price the idea of Fed rate increases. You went from a four rate increase move in December, Jim, to two at your meeting last week, and yet markets price in still only one. What is going on? If you look at the numbers, at your forecast, you should be raising rates already. Is the dot spot a mistake? Are we confusing people at this point? JAMES BULLARD: Well, I've started to wonder about the efficacy of the dot plot on the policy rate part because we're implicitly giving some kind of forward guidance through that dot plot and I'm wondering whether that's counterproductive at this point. When we were at zero and then we put out a forecast when we were going to come off zero, that was considered forward guidance and that was considered helpful. But now that you're off zero and you're projecting these things out over the next two years, the pace of increases over the next two years, you're still implicitly giving forward guidance, and I'm not sure that I'm really comfortable giving that kind of forward guidance in this environment. In the past, you look at Greenspan Fed or Jean-Claude Trichet ECB, they never gave any kind of indication about where rates were going to go and that, I think, served a purpose because it kept people focused on, what is the data really justifying at this point, and it let market expectations move around as the data came in. But now we've got a dot plot that's got these kind of lines, median lines on it, and I'm not quite sure that's really what we want to be doing. MCKEE: The Fed should get rid of it? BULLARD: Well, I've thought myself about unilaterally pulling out. I suppose it wouldn't do much good. You'd still have a lot of dots there, but I do think this important issue we have to think about, what are we really doing with this dot plot, and of course, financial markets have been talking about it a lot and we have our own communications committee that's talked about it a lot. BULLARD: Well I am not revealing my dot because I want to get out of the game of, how many rate increases this year? I want it to be meeting by meeting, we're going to react to the data, and we're going to take a reasonable policy that will get inflation back to target and will keep the economy on a good recovery path. TOM KEENE: This chart is a St. Louis Cardinals odds of getting to October. The blue line is the Boston Red Sox. Jim Bullard, I saw a pick up truck one night back up to the Mississippi River, and under the arches, threw your textbooks from Indiana University into the Mississippi River. Is any of this in your textbooks or to be respectful, is it in the textbooks of Mr. Rosengren or Mr. Lacker and the others? BULLARD: No, it's not. Central banking was turned upside down in 2008 right about the time I became president of the St. Louis Fed. It's never been the same since. KEENE: Which hymnal are you speaking from right now? BULLARD: We have very good research staff and we work on these questions every day. I think we've got a lot of good ideas and good theories but it's certainly not the same world we lived in in the 1990's or the early part of the 2000's. MCKEE: Three of your colleagues, John Williams of San Francisco, Dennis Lockhart of Atlanta, and last night, Patrick Harker of Philadelphia, suggested yes, indeed, we should consider a rate increase in April. Do you think the economy will have developed to the point that April should be considered a live meeting? Would you consider raising rates in April? MCKEE: Well that's the boiler plate. I'm talking about, based on the economy. BULLARD: I think they should all be live meetings, I think it's really hurting us that we've got this kind of alternate meeting thing. I think we should make all meetings ex ante identical. You should have press conferences every meeting. I've long been an advocate of this and that will allow the committee to come into a meeting, assess the data as we should in April, and see where we are. The data between December and March was not all that different. It didn't look like we were that far off our path when we got to the March meeting, so in that sense, I think there was a credible case to be made to move in March. We didn't do it so now we can look at April and see what the data looks like when we get to April. MCKEE: If the data don't move, then you're saying it would be credible to consider a move in April? BULLARD: Well, we're basically on the same projected path that we said in December and we're maybe a little bit off, you could argue about global risk, you could argue GDP outlook is maybe a little bit lower, maybe, but you get another -- looks like labor markets are improving, you can probably make a case for moving in April. KEENE: Let's talk Rudi Dornbusch and Ken (ph) Rogoff's great work summarizing what Professor Dornbusch did on the word overshoot. Right now, we see inflation moving higher. We've got core CPI movement, Mike's mentioned that a number of times. I love the Cleveland CPI. Cleveland is a bank to the East of St. Louis, you may know it. The Cleveland CPI, not the St. Louis CPI, and they're migrating higher. Can you afford an overshoot in inflation? BULLARD: I think we are going to end up overshooting on inflation. We have that as part of our forecast so we have for a while. That is what's going to happen, and if you look at the Dow's Fed trim mean PCE inflation rate year over year, it's 1.9 percent and moving up, so I think all these inflation measures, if you look at them, they're all moving up and we probably are going to come over 2 percent by the time we get into 2017. KEENE: Is that overshooting part of the so-called inflation (ph) neestus territory or can you find a constructive inflation a la Olivia Blanchard's work at the IMF that can help heal nominal GDP, can create investments through animal spirit? BULLARD: I don't have any problem with overshooting. I found the whole discussion about this issue, if you're at 1.5 percent, you're missing by half a percentage point. If you're at 2.1 percent, you're missing by one tenth. It's better to be at 2.1 than 1.5. You want to be as close as you can be to your inflation target, but it's a symmetric target. You can be above or below. There's no problem with that. So I think we are going to overshoot and hopefully they'll follow my policy choices and we won't overshoot very much, but I think we'll probably overshoot. 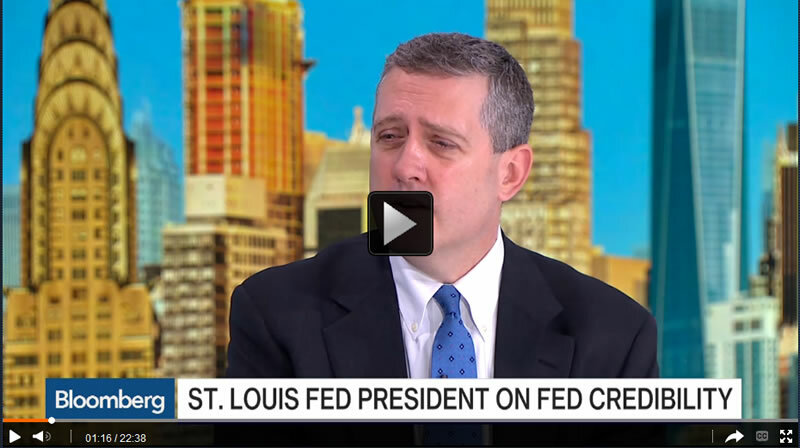 MCKEE: We are speaking with St. Louis Fed president James Bullard. If you overshoot, is inflation low enough that monetary policy can catch up? The argument has always been that inflation can get ahead of the Fed and accelerate too quickly? MCKEE: You can catch up, in other words? BULLARD: Yes. I think, falling behind the curve is something that has happened in the past in central banking but I think we'll be able to handle a situation this time. KEENE: Is St. Louis the central banker to the world? I mean, we've had a shift here with the last press conference. We speak of Chair Yellen, the central banker to the world, but can you state that the collegial group of the FOMC, whether it's Atlanta, Dallas, St. Louis, Boston -- your combined central bankers to the world? BULLARD: Well, the U.S. central bank is certainly a world leader. We do have a major counterparty and the ECB in Europe, the European economy is a similar size to the U.S. economy, and you've also got rising China, but China has a different -- you've also got Japan, but China has a different economy, not as much capital flow, a managed exchange rate regime, so they've kind of got a different situation there. MCKEE: One thing we didn't get from this month's Fed meeting is a sense of what it is that you're looking for as a committee. What's the reaction function now? What would make you move? If you say overshooting on inflation is not only OK but expected and the jobless rate's going to go down to 4.5 percent, what is it that triggers the move if you haven't moved yet? BULLARD: This is a great question and this is why you should listen to my speech tomorrow which is, I'm going to talk exactly about this. So we made a projection in December. Then we got to March, and if you actually look at the data in March, it wasn't very different from what was projected in December. So when do we move? We must have been thinking of some other kind of data other than what was in the projections. We cited global risks. I've cited inflation expectations, so there are other things entering into the decision other than just the outlook for GDP and inflation and I think that is causing some confusion, maybe among policy makers ourselves and maybe among financial market participants. MCKEE: Well, the other thing that wasn't in the statement, the balance of risks, is that gone now? Where do you see the risks? KEENE: This is right where I wanted to go. We talk about the cross moments, skewness, kurtosis, there's 12 people out there that get it, they all have Bloomberg terminals which is a good thing, but come on, Robert Solow, the laureate of MIT who invented economic growth thinking, says modern DSGE theory doesn't pass the smell test. I get that. What's the new theory to replace the mathiness and certitude that too many of your colleagues are weaned on? You've been a breath of fresh air here. BULLARD: Solow's comment is a misinterpretation of what DSGE theory is. It's a framework, it's a way to do macroeconomics, but as far as the assumptions that you might make or the models that you might build that would fit the data, there's a wide variety and you can get all kinds of possible theories within that framework, so you shouldn't throw out that. What you should do is put the right assumptions in, put the right things in, show that you can match the data. KEENE: Put the right assumptions in, and he talks about unexpected shocks, one of them which Mike and I have talked about this morning with David Kotok off of (ph) work by eisenbeiss, formerly with Atlanta, is the idea that we're bringing disinflation and deflation in, and frankly, other shocks dampening U.S. rates. Do you go day to day at St. Louis with your incredible research combine feeling that rates would be higher if? BULLARD: I don't think we've been able to get a characterization that I really like, that I've been willing to promote, but I'm interested in that idea, and it certainly feels that way when you're making policy. It feels like you're swimming upstream all the time. MCKEE: You were seen as a dove going into the March meeting, speaking of inflation, because you were talking about inflation expectations possibly becoming unmoored and for the last six months, inflation expectations have been going down, but if you put up a chart, say, of the five year forwards over the last six weeks, they're going up again. So is that problem behind us? BULLARD: Well, I'd like to seek further stabilization in inflation expectations. I have been concerned about this. They reached post-crisis lows in February. That's what got me to really ring the alarm bell on this. They are stabilizing, I think that's a hopeful sign. I hope they'll continue to go up. They seem to be highly correlated with oil prices and that's disturbing because oil price movement shouldn't have anything to do with the five year five year forward, tips based inflation measure, but it seems to. So we're watching, continue to watch this very carefully but I am concerned that we not normalize in a situation where inflation expectations are going down. My interpretation of Europe is that they waited too long at the ECB when their inflation expectations were drifting down. They waited too long to take action and now they're, it's going to take them a long time to dig out of that hole. MCKEE: James Bullard from the St. Louis Fed with us. A lot of people have asked why we haven't seen a serious pickup in inflation given all the stimulus that has been thrown at the economy, zero rates, QE, by the Fed. A few days ago you suggested maybe zero rates are the problem in and of themselves. BULLARD: Yes, so that's our -- sometimes I put on my more radical hat and I gave this, I've given a couple speeches on permazero. You can click on them on the web page. Gave one in Frankfurt, permazero in Europe, just on Friday night, so the idea is that because of the Fisher effect, which is nominal interest rate equals real interest rate plus expected inflation, if you're going to keep the nominal interest rate at zero and you think that real rate's determined by the market, then expected inflation has to fall. And that idea's been gaining more currency, but it's untested at this point and I wouldn't use it to make policy rate at this point. KEENE: The permazero for too many of the people that follow Bloomberg Surveillance, they follow Michael McKee and me, and we get blistering e-mails, as I'm sure you do, from people that are not the elites. They don't have your education or Mike's and my zip code and that. I want you to speak now to the people in the St. Louis district who go, I'll give you a permazero. It's been my income for ten years. Where does the economic growth fund come from? And you're the guy in your district that's seen the manufacturing drift away, that chronic sense of permazero for America. Where do we get the growth? BULLARD: The central bank cannot drive the growth process. Here's what monetary policy is. There's a business cycle and if you run a good monetary policy, there's still a business cycle but it's not quite as big as the previous business cycle. So that's what monetary policy is. The growth rate is driven by long run factors in technology and human capital and what the U.S. needs is a better medium term growth strategy and you need everyone to get on board with that growth strategy. That's what you need. The central bank cannot do that. KEENE: Can the next president do that or does that come from congress -- ? BULLARD: Definitely could do that. The next president could definitely could do that. MCKEE: The implication of the neo-Fisherian idea is that the sooner rates rise, maybe the better. Are rates, are low rates, close to the zero bound, and QE, et cetera, all of your extraordinary policies, much of which is still in place, still contributing to growth, are they still effective? BULLARD: I think they are still accommodative. I think we're providing a very accommodative policy with our zero interest rates and our big balance sheets, but I do think you want to be edging closer and closer to something of a more normal setting so that you don't get stuck in this zero rate environment the way Japan did. So you want to edge your way toward a more normal nominal interest rate structure. I think that would get us back to the kind of equilibrium we had in the 80's and 90's which was really pretty good. Good growth economy, everyone understood what monetary policy was doing, interest rates moved around in the right way to inform that equilibrium, so that's, we would like to get back to that. KEENE: I would suggest we should say that new-Fisherian policy is not the vice chairman of the Fed. MCKEE: Not the vice chair. KEENE: Who was Irving Fisher? KEENE: Why do the economics of Irving Fisher, my grandfather's age, before Schumpeter, actually -- why does that work now? BULLARD: Yes, well, spare all your viewers having to read what he wrote. He's a famous economist but he wrote one thing. Nominal interest rate can be divided into a real interest rate and expected inflation. That's all you need to know. MCKEE: You've said -- James Bullard from the St. Louis Fed is with us. You've said in the past that whatever you think the interest rate should be, given the current economic conditions, we're not there. So if you're looking to get back to more normal, what would normal be? What would be the appropriate setting for the kind of economy that we have now and that you see over the next year or two? BULLARD: You mean the long run policy rate or -- ? MCKEE: Yes, well, long run, of course, depends on where you define medium ending and long run ending, but yes, what is our star at this point? BULLARD: Our star is this real rate thing, so the short term real rate, people think it has come down a lot. I doubt that it has come down as much as people think. So I still have our star maybe two percent or higher and likely to move higher in the future. If you look at other measures, we've got blog posts and stuff on this, I think the way to think about this is, this does not move a lot over the short term. It moves slowly over time, and the idea that it's way down at zero or at a very low value, I don't buy that. KEENE: One of the things that's bothered me, Jim, recently, Mike and I, we literally have a gong in a radio studio when people say, it's to humanize the market. The market vigilantes are going out, they're going to get Janet Yellen. They never want to get Jim Bullard. It drives me absolutely insane. Bring up the dot chart again, Rachel, if you would, and the basic idea here, folks, is the blue line is wrong and somehow that blue line's going to migrate higher and join Jim Bullard's estimates. You, with all your work, have a great respect for where that blue line is, the market. Do you assume that it's going to just stay where it is and you're going to catch up -- ? KEENE: That's a huge gap, and that's the headline. BULLARD: -- that will have to get reconciled. I've been worried that it will get reconciled in a violent way. I hope that doesn't happen and cause a lot of turmoil in financial markets, but I think what will happen is that as inflation starts to come up and we get more credibility that really it is going back to two percent and in my view, even going over two percent, then I think that blue line will start to come back up. Now what's feeding into that blue line is a lot of ideas about, central banks can't control inflations, the Fed won't be able to get back to two percent, inflation will be permanently low, those kinds of ideas. And I think those will go away as inflation rises here during 2016. MCKEE: We're talking with James Bullard of the St. Louis Fed about the dots -- as you can see it on the Bloomberg Terminal, dots go and how the Fed's forecast for interest rates, if you read it into the dot chart, is much higher, the blue line being the market expectations that we're talking about, which leads me to this. Your former colleague from the Minneapolis Fed, Narayana Kocherlakota, writing for "Bloomberg View" yesterday, suggested the Fed has a credibility problem. Promises to be gradual might have to be jettisoned if inflation picks up as you suggest it will. Promises to raise rates might have to be dropped if the economy slows. Here's what he wrote. Officials must recognize that their expectations for the economy, like all forecasts, are likely to prove wrong. As a result, they should be much clearer about their willingness to make large and rapid changes in monetary policy. Would you agree? MCKEE: That's the Fed's forecast, a summary of economic projections. BULLARD: Is that some kind of promise about what's going to happen? And Chair Yellen says, absolutely not. Absolutely not. It's a conditional thing that depends on how the economy develops, but I think it could be misinterpreted as some kind of promise or some kind of forward guidance. That's why I'm getting increasingly concerned about, what are we doing with these policy projections, and is it really having the effect that we intend it to have where it's just kind of gentle guidance about what might happen in the future as opposed to a commitment to how the Fed will behave in the future? The committee does not want it to be a commitment, certainly not at this juncture, and nevertheless, you could see why markets might interpret it that way. So he's saying, we've got to be better about showing how (inaudible) we can be and that we will move around with the data. MCKEE: Only about 30 seconds left, but I've got to quickly ask you about the latter half of Mr. Kocherlakota's statement that the idea that we might see the economy slow significantly and the Fed have to react. What are the odds of that? BULLARD: That's certainly not a base case. You can always get hit by a big shock and something bad can happen. That's the world we live in and maybe that will happen, but that's not the base case. I think we'll get slow but good growth in 2016. MCKEE: James Bullard from the St. Louis Fed, thank you very much for joining us. Maybe suggesting getting rid of the dot plot and interest rates are going to have to rise if inflation rises and growth continues to improve. BULLARD: Always great to see you guys. Go Cardinals. MCKEE: We didn't even get to ask you about the Cardinals. All right, thank you.